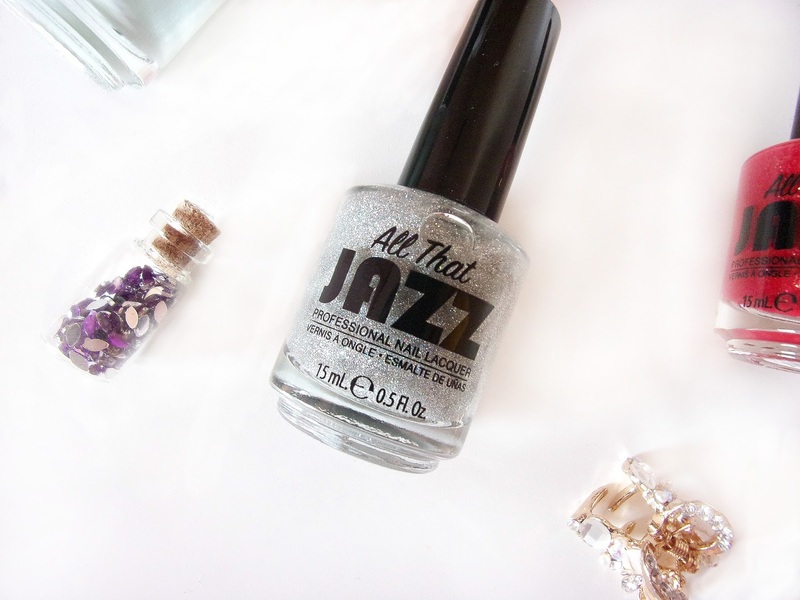 Lately, I was given the chance to try a nail polish brand completely new to me; All That Jazz. They offer a professional lacquer range that boasts a quick drying time and an exceptional lasting period up to one week. Salon quality from the comfort of your home, sounds good right? They also provide tools and nail art foils. 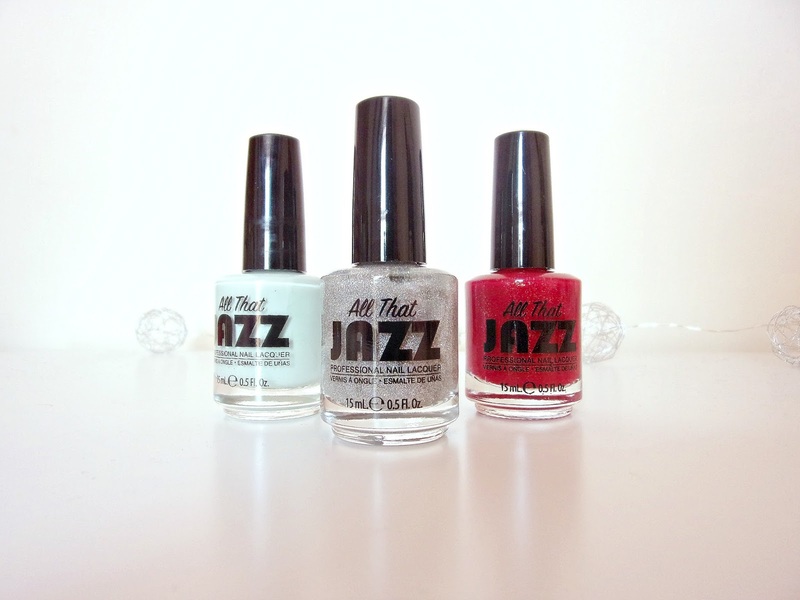 Although I hadn't heard of them before, I was quite impressed when I received the polishes in the post. They have that heavy glass bottle feeling, quite reminiscent of the OPI polishes. The bottles have 'All That Jazz' printed in bold at the front, and the shades really pop against the packaging. Each polish contains 15ml of product, which is the same as OPI and more than China Glaze (and they have the most that I've seen). Apples and Pears* - A pale mint green (here). Disco Devotion* - A really fine silver glitter (here). Don't Step On My Red Bottoms* - A bright, statement red with fine golden specks (here). The formula of these polishes is quite good in general. Don't Step On My Red Bottoms (goodness me, that sounds weird aloud) was opaque in one go, and so was Disco Devotion ( as opaque as glitter polishes go). Apple and Pears could also have been opaque in one coat, but it was slightly more runny so I had to do two coats to avoid streaks. The drying time was great! They do dry super quick in less than a minute, but you'll need to leave another minute aside to avoid the tacky feel. My favourite shades are Don't Step On My Red Bottoms and Disco Devotion as I'm like a magpie with anything glittery. Disco Devotion can either be used as an overcoat but also on it's own as the glitter really does build up in 2 layers, so it gives it a nice effect rather than a sparse bit of glitter here and there. The only reason Apple and Pears isn't one of my top shades too is because I find it quite hard to pull off pale/pastel shades, but I think this will be a nice Summer shade if you can pull them off. I was also given two nail art foils to try. Previously, I gave some Essie foils a go and it went badly to say the least! They were fiddly and most of them ended up falling off after 10 minutes. The foils I tried were the Love - Gold* and Spiral - Silver*. The foils are quite inexpensive at £1.79 (here), however I'm not to keen on the patterns. They do however have some more designs on their website, you can also get them in more colours such as rose gold. I think these would look a lot better than the standard silver/black I see quite often. These metallic foils are stickers, so you're supposed to be able to peel them off and then stick them on top of your nail. However, I had recently cut my nails so these were a bit long for me. In this situation you would apply them as usual but then use nail scissors or a file to get rid of the ends. They can also be a bit flimsy, as I mentioned before, part of one sticker just came off when I was trying to apply it. The end results didn't look too bad though! However, I still don't think I'm a convert to nail foils. P.S I'm sorry for my absence over the last month, I had a family emergency which has kept me quite busy. It's nothing to worry about though as things are finally starting to look up! Do you prefer nail polishes or foils? I haven't heard this brand before! Red's name is so weird, why would they come up with names like that :) I prefer nail polishes, I am really bad with foils, I end up making such a big mess! I just find your blog and I love it! Your posts are very interesting. Amazing blog! Love those nail polishes! Their colours are very beautiful. Definitely prefer nail polishes myself - I'm like you where the stickers never stay on for long. I'm such a sucker for pastel and dark neutral shades though, so Apple and Pears is right up my alley! I actually have a similar color to it, but it's not as pastel. Would love to try this brand out! I haven't heard of this brand before but it sounds pretty good! The green shade is pretty, I love pastels! I'd naturally be drawn to 'dont steop on my red bottoms' hahahha. Cute colors. I love a polish that holds up for that long. Great brand. I've never heard of this brand before but the apple and pears shade is so pretty! I'd have to try it out if I can get my hands on them. I haven't heard this brand before but all the shades are pretty. The names of these colours are so funny, especially the red one, but the colour is so beautiful! They are all gorgeous wow!Nice review. I love all those colors! I actually love pastels so the Apples and Pears is right up my alley. Never tried nail foils, but they look fun! Ahh you've just reminded me I desperately need to paint my nails - oops! 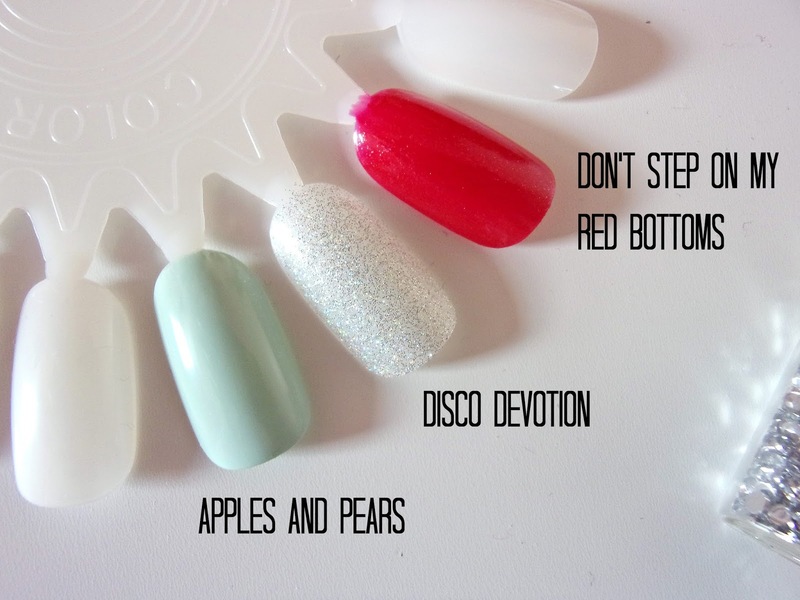 I love apple & pears, pastel shades are a favourite of mine and that one is so pretty! I've never heard of this brand either, but they seem great, based off your comparisons and review! I really love the Apples & Pears shade, it's so pretty and like you've said, perfect for spring and summer! Thanks for sharing, beauty, and I hope you have a great week ahead! Apple and pears is definitely my fav out of the three! I'm totally digging "apples and pears". What a pretty color! Apples and Pears is such a pretty colour! I love the pale mint, which is a great pop of colour for the colder seasons! 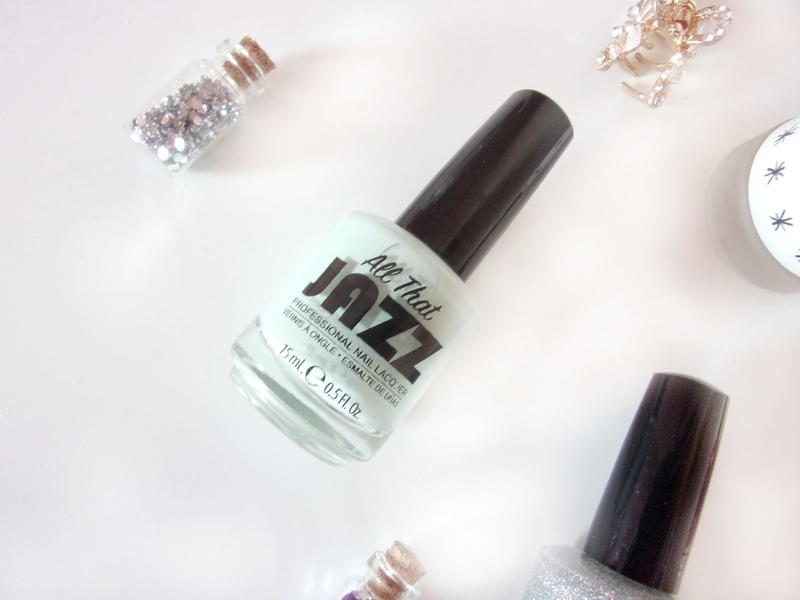 Apples and Pears is such a gorgeous shade, I love pastel colours like that! 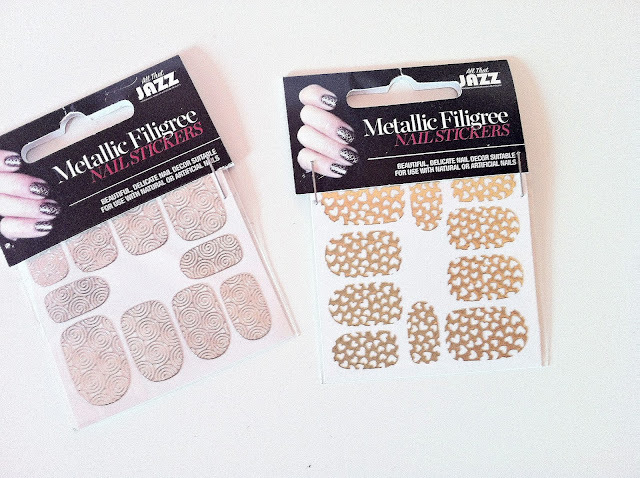 This brands is new for me but sounds pretty good, the nail stickers are beautiful. I love the colors.They look cool. Apples and Pears is is such a pretty shade! It's the first day of spring for me here so it's time to bring out the bright floral colours! I've never tried nail stickers but they seem like a good idea for people like me haha. Apples and Pears seems like such a beautiful pale shade! I could wear that any time!